Mark Duncan at Yachting Partners International alerts me to a further €925,000 price drop on Matt Albert's joint listing with Rainer Wilhelm at Ocean Independence, the 30.5m cutter-rigged sailing yacht Havana of London. 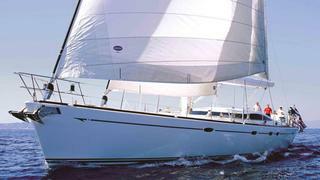 Designed by Bill Dixon and built by Vitters in 2000 to ABS class, her second owner bought her in 2006 and has spent considerable amounts of time and money keeping her in first-class condition. A luxurious pear wood interior accommodates six guests in a large master suite and two twin cabins, along with a crew of four. Never chartered and on view at the May Superyacht Brokerage show in Palma, Havana of London is down from €4.9 million to €3,975,000.